Above: Hastings before. Below: Hastings after. A mere matter of days after SEH Engineering announced the preferred alternative for the Hastings Way project, the city council officially kicked off the Barstow Street reconstruction by awarding a $100,000 design contract to Ayres Associates. The Hastings work, which will be a major story all next year, will include wide sidewalks on both sides to accommodate pedestrians and bikes, a median with trees, fewer lanes, and possibly an underpass (no roundabouts). Check out SEH’s website for more specifics. Looking forward, Ayres Associates is now charged with the design of downtown’s most crucial roadway, but first will need to analyze transportation and land use, and hold several public input sessions. 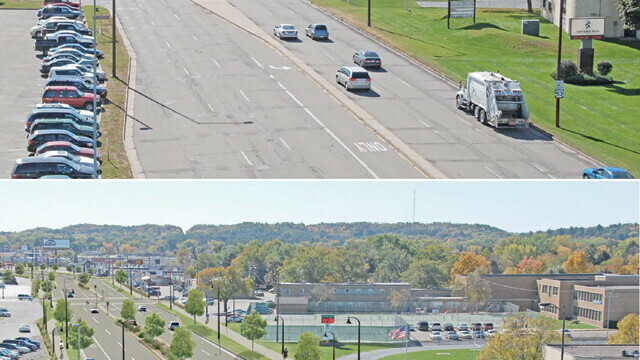 Some of Eau Claire’s city council (and a handful of community members) have voiced hesitancy to invest in the reconstruction of this thoroughfare, alleging that it’s not worth it. Of course there are plenty on the other side of the fence as well, voicing their visions for a better downtown – many of which could start with a creative re-design. So the battle for the future of Barstow is still on. Meanwhile, nearby communities like Marshfield have gotten it, as they just finished a total downtown street reconstruction and businesses were so convinced of the opportunity for change that they took the construction window as an opportunity to invest more than $1 million of their own private money on improvements to their own buildings. That’s a city with less than a third of Eau Claire’s population, but with the clear vision to make the private investment needed for significant economic and cultural advancements. Watch VolumeOne.org closely for information on upcoming public meetings on Barstow.